Renewing and paying? ... stop confusing me! No need to. Renewing and paying are 2 easy, successive steps in the same proces. First you renew your subscription and then you can pay for it. How can renew my yearly subscription? It this point, your invoice is created and waiting for your payment. Where can I find this 'renew subscribtion' button? Make sure you login first. 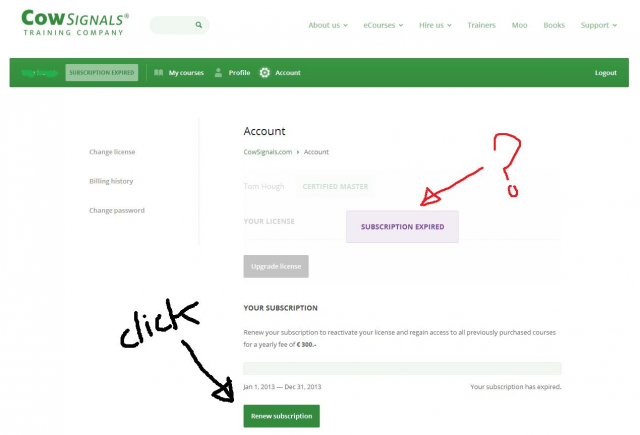 If your yearly subscribtion and licence expired, you will see a purple text box that says: "subscription expired". If you see this, click on the green button that says "renew subscripion". The picture below shows you what to look for. Click it to enlarge.